Asahi Camera, March 1971, within feature 'Searching Journeys 3'; Moriyama, Kariudo [Hunter], Chuokoron-sha, 1972, n.p., laterally reversed (figs.1-2); Szarkowski & Yamagishi (eds. ), New Japanese Photography, The Museum of Modern Art, New York, 1974, n.p., laterally reversed & variant cropping; Szarkowski, Photography Until Now, The Museum of Modern Art, New York, 1989, p.261, laterally reversed & variant cropping; Phillips et al., Daido Moriyama: Stray Dog, San Francisco Museum of Modern Art, 1999, front cover (detail) & pl.22, no.133, variant cropping; Daido Moriyama 55, Phaidon, 2001, p.55, variant cropping; Daido Moriyama, Fondation Cartier pour l'art contemporain/Actes Sud, 2003, pp.8-9; Hunter of Light: Daido Moriyama 1965-2003, Shimane Art Museum/NHK Educational, 2003, covers & pp.140-41, pl.179, titled 'Dog Town'; Daido Moriyama: The Complete Works, Vol.1 1964-1973, Daiwa Radiator Factory, 2003, p.312, no.860; Tucker et al., The History of Japanese Photography, Yale/The Museum of Fine Arts, Houston, 2003, p.249, pl.167, laterally reversed & variant cropping. Moriyama: I like the sensation of chopping. I get carried away and keep cutting until I get to the 4x5 proportion. Araki: That's why you produce two or three versions of each photo. Even in the darkroom, I have the feeling you create new pictures. You're not able to print out a negative twice in the same way, are you? Moriyama: No, I can't. It's impossible for me. 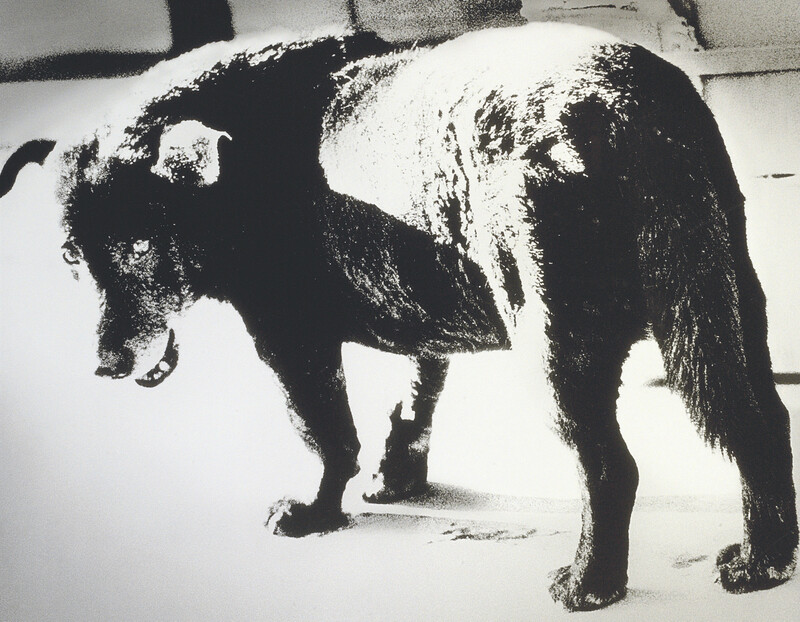 Araki: That's why in each exhibition, the photo Stray Dog faces a different way, in one direction this time and in another the next! I had taken a photograph of a stray dog, showing the whites of its eyes and snarling, on the streets outside a US air base in the town of Misawa in Aomori Prefecture in northeast Japan. The strong image of that photograph had caught the eye of many people, and thereafter that dog and I came to be seen and talked about as if somehow superimposed on each other. Also, the figure I cast during that time, roaming around town and on the back streets, carrying my camera, appeared in others' eyes very much like a stray dog.